Niesen and Son Landscaping can handle every stage of your landscape project from design to implementation and ongoing maintenance. We provide a wide range of services to cover all of your landscaping needs. As a locally-owned and operated company, we take the time to understand your specific needs. In determining the needs for your project, we leverage our team of experts to make sure you get the most out of your budget. We stand proudly behind every job. Our business is to deliver professional, quality landscaping, every time. Everyone on your staff who was involved was so very kind to us and helpful in every way. We so appreciate how the work went each day, and are very thankful that the project was completed in such a timely fashion. 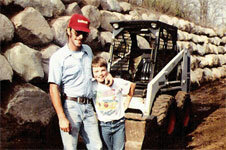 Niesen & Son Landscaping, Inc.
© 2010 Niesen and Son Landscaping, Inc - All Rights Reserved.